Deciding when your child is old enough for his or her first cellphone is tricky. The benefits of staying connected with your kids are obvious – it’d be great for them to have emergency contacts available at the push of a button. But at the same time, even a disposable prepaid phone can be too expensive for an absentminded tot. If it doesn’t get lost, it’ll get broken – that’s just how it goes. AT&T’s newest communications device aimed at smaller children isn’t your traditional phone, however. 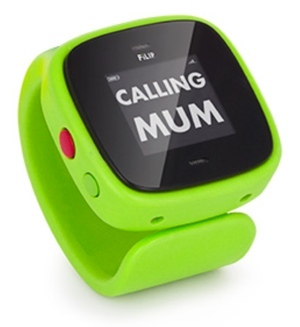 Meet the FiLIP, a colorful, wearable watch that doubles as a pared-down phone for kids. FiLIP itself is a basic “smart communications” device. It lets you program up to five trusted contacts, which your child will be able to call or receive text messages from. (Kids won’t be able to text back, the company says, “because sending a message back becomes too complicated for kids.”) The device also works as a tracker, giving you the ability to locate your child using your own smartphone at any given time. And if your little angel wanders off somewhere he or she's not supposed to be, FiLIP can be configured to send you an alert. FiLIP also features an "intelligent emergency" mode. If your child holds down the device's emergency button for three seconds, the phone will send all five trusted contacts a text message with your child's current location. FiLIP will then attempt to call down the list of contacts until someone is reached. If no other option is available, FiLIP will call 911. FiLIP will come in your choice of four eye-catching colors. According to AT&T, both the device and pricing information will be available in the U.S. “in coming months.” If you’d like to learn more about FiLIP in the meantime, check out the device’s website at myfilip.com. I have 2 boys ages 7 and 9 who are very active. This would be perfect for our family, but we have a contract w/ Verizon Wireless. Is there any talk of making this available on other wireless carriers?